A yagi antenna is a specific type of directional antenna, which means that it sends and receives a signal from primarily one direction. A good way to visualize this is by thinking of a flashlight. The light from a flashlight shines in a narrow beam, only in the direction that it’s pointed. If you shine a flashlight on something close, it illuminates a small area, but if you shine it on something further away, the illuminated area is larger. In this same way, a yagi antenna transmits and receives radio signals from a single direction and the farther away the signal gets, the wider the beam becomes. Since yagi antennas are designed to only send and receive from a single direction, they are able to transmit a much stronger signal than omnidirectional antennas and can also receive weaker signals making them ideal for situations where the existing cell phone signal strength is low. If you have a strong signal and need to send and receive signals in multiple directions, you would instead choose an omnidirectional antenna. 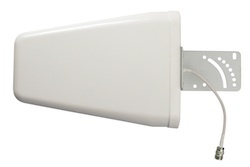 When used in a cell phone signal booster system, a yagi is most often used as the external antenna that is located on the outside of a building where the cell phone signal is strongest. Yagi antennas are designed for a specific frequency range so before purchasing, ensure that it will work with the same frequencies as the signal booster you’re using. All of the kits on UberSignal.com have properly matched antennas so you shouldn’t have any trouble. To lessen the chances of oscillation (feedback) make sure the yagi is not pointed over your own roof. 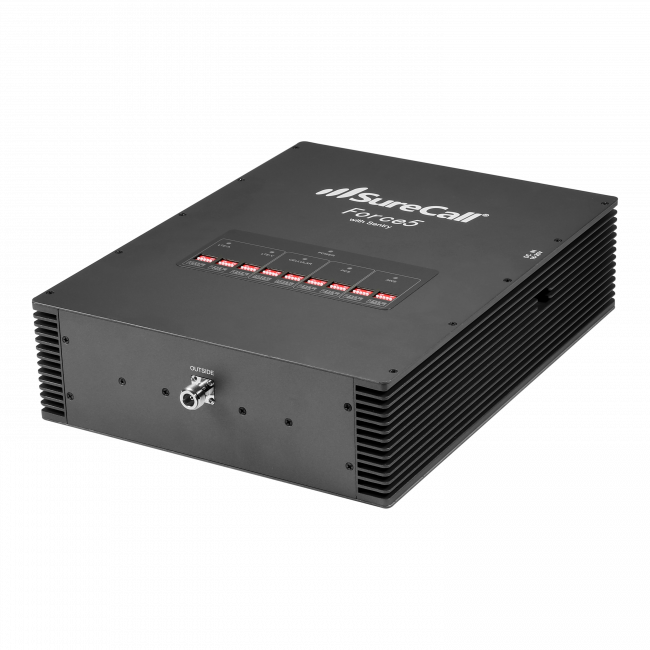 Most of our cell phone signal booster kits are designed to amplify the signals of multiple cell phone carriers at the same time. That way, regardless of your provider, the system will just work for everyone’s cell phone. This will continue to work with a yagi antenna if the carrier’s towers are in the same general direction. However, if you want to support multiple carriers and their towers are in different directions from your building, a single yagi antenna can’t be pointed in multiple directions and won’t work properly. In this situation, you can either go with an omnidirectional antenna if the existing signal is strong, or you can use multiple yagi antennas, each pointed at an individual carrier’s tower. When using multiple yagis, they should ideally be mounted at least 10 ft apart and not pointed at each other to prevent any interference. Then use a signal splitter to combine the two antennas into one cable that can be attached to the amplifier. Because a yagi is a powerful antenna, there may be situations where it can overpower the cell towers and cause your system to malfunction. All signal boosters contain circuitry to detect and prevent this from happening so if you see your signal booster shutting down or displaying a warning light, it may be because the signal is too strong (another possibility is that there is feedback between the inside and outdoor antennas). In this case, just point the yagi off to the side of the cell tower instead of directly at it. The further away from the cell tower you point the yagi, the weaker the signal it will receive which may solve your over-powering problem. With any external antenna, it’s important to remember that it will be exposed to mother nature, which can be very tough on equipment. In particular, antennas are susceptible to lighting strikes since they’re made of metal and have some level of electricity flowing through them. Because of this risk, we always recommend using a lightning surge protector between the yagi and the amplifier. Another thing to consider is wind. Some yagis come in a plastic housing, which can catch more wind and put significant strain on the pole during wind storms. Always make sure the antenna is securely mounted to a pole and that the pole is securely mounted to your building or you may end up losing some equipment in the next storm! If you have any questions about yagi or any other antennas for your cell phone signal booster system, please contact us and we’ll be happy to help. I live in Mexico in an area where signal strength for cell phones is weak ( one carrier is Telcel and the other is Moviestar ) .... I have a cell phone from each carrier. It's not that I am miles away from a cell tower ( in fact we are less than 1Km as the crow flies ) .... it is more than we don't have direct line of sight and appear to be in a dead spot. Not being that technically savvy on cell phone issues, I need some advice. I would like to know which of your Yagi antennas you would recommend for my application and which receiver/cell phone booster system you would sell/recommend..
Is the connection between the antenna and the receiver wireless or cabled ? How is the connection between the cell phone and the indoor receiver/booster made ... wireless or cabled or a dock of some sort .... can i walk around in the house with the cell phone and still have it work ? If you can come up with a solution for me, I might need the same setup for my house ion Texas where I live 6 months of the year but there too we are in a dead spot. I live in phil a province where thrres mo signal because were too far from the tower i want yo have signal but what should i do or need to have it?is that one can help me hm is that? Unfortunately, our signal boosters don't support the frequencies used in the Philippines, so we aren't going to be able to help you unfortunately. Hopefully in the future we'll be able to find some international boosters. My fiancee has bad reception in her house. She uses At&t, you can stand outside the house and get great reception but anywhere inside the house is DEAD. Will this antenna help? Can I combine yagi antenna for out side with pannel antenna for inside? or should I just get Omnidirectional antenna for outside and Pannel antenna for indoor since I am not aware of the cellular system being used other than GSM phone system. With pannel antenna in muiltiple floors (four concrete floors) can it work?. Do I need to make a connection between outside antenna and inside one?. Also do I need lighting protector (thunder strike) for these antennas? There is a weak signal outside and nothing inside in the house. what will be my best solution to receive and make cellular call? You can combine any type of inside and outside antenna, but to make it work, you'll also need a signal boosting amplifier. Connecting the two antennas directly together won't do anything to help your signal. And the concrete floors won't allow the boosted signal to easily travel between floors, so you may need an inside antenna on each floor. If you need help finding the right system, use the contact us page to either call us or send us an email. I live in US in a very mountain area "downhill" need to buy a Signal Booster/Antenna something for our TMobile iPhone 5c phones .. what Do you recommend..? If you go to our homepage, there's a link to our T-Mobile page where you can see all of the systems that will work for T-Mobile. Which system is best depends on how strong of an existing signal you get when outside the building and over how large of an area you need to cover with the boosted signal. Feel free to use the contact us page to get in touch with us if you have more questions. Have good signal outside, poor in 5,000 sqft home. 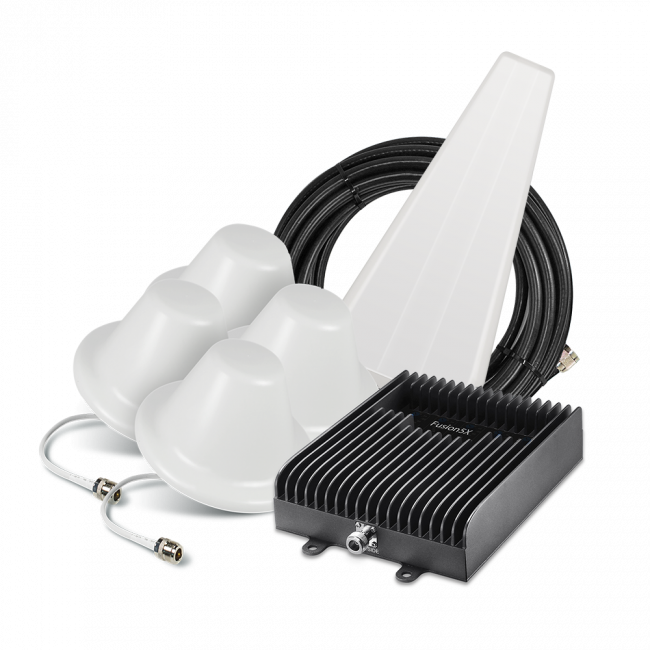 want to use the triflex kit, mount uni directional antenna in a dormer window and the interior antenna in the ceiling in the center of the house. Problem is to avoid signal interference between antenna. I will not be able to get required 20ft vertical separation, may get ten ft at best and 50ft horizontal. With this setup how can I 'shield' the two antennae from each other if I get interference? With 50 ft. of horizontal and 10 ft. of vertical separation, you're doing pretty well. The only way to shield one antenna from another is to use something metal between the outside and inside antenna to block the signal. Some people use metal objects like filing cabinets while others use aluminum foil or a metal foil used as a radiant barrier. 5,000 sq ft of coverage inside is a lot to ask from a tri-flex kit. To ensure full coverage, you may need a more powerful amplifier. I just moved to a new office in Manhattan. Outside, I get great signal, but my side of the building gets 0 to 1 bar, maybe 2 on occasion. What would be the best product for me at my desk. I'm most concerned with data, but voice calls would be nice too. For a signal booster to work, you'll need a nearby window where you can mount an antenna. You must get at least 1 bar of service at that window. If you have that, then a Wilson Sleek with a Home Accessory Kit will work, but it's a cradle booster so your phone must be in the cradle at all times. 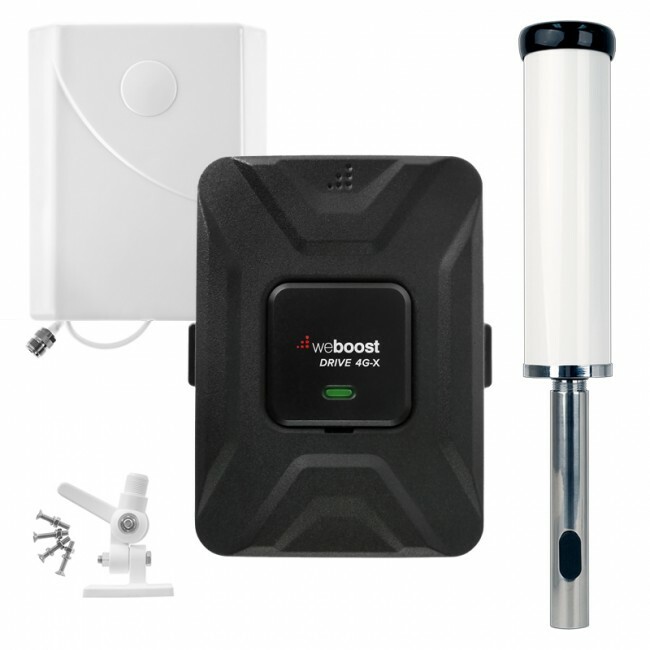 If you need wireless coverage, than the Wilson SignalBoost DT is best and will cover a small area (3 to 6 ft. from the inside antenna) with a boosted signal. If you don't have a window nearby, it's difficult to say in any signal booster would work for you. Sirs just want to clarify if line of site between the Yagui antenna and the tower is a basic requirement to make the device work? Yagi's work best when you have line-of-sight to the tower, that said, it's not typically an absolute requirement. If you get a fairly steady signal, even if it's reflected, then a yagi can usually be aimed so that it can pick up that signal. If however, your signal strength is constantly bouncing around, that can mean that the signal is reflecting and taking multiple paths to your phone and a Yagi antenna may not work as well in those cases. HI, Quick question for you....We live in a very hilly, remote area, completely off the grid. I can not get a signal with my new phone, the Galaxy Stratosphere, older phones work well if on the window sill and on speaker. Would the A Wilson 14 dB Gain 1900 MHz Yagi Antenna (301124) for us? Does it require electricity?? would it be better to go with a moble model???? thanks for your help! Our cell phone is our only form of communication unless we fire up the generator & turn the internet on. A directional antenna won't help unless you can connect it directly to your phone which is not possible with virtually every new phone. So you would need a full signal booster kit which includes an outside antenna, inside antenna, signal boosting amplifier, and cables to connect everything together. Hi: At a remote wilderness ski hut, we've successfully used a Yagi for about 15 years plugged into a now ancient Motorola flip phone to receive signal from a Verizon (Golden State Cellular) tower about 15 miles away. This year, it was not possible to make calls, though 4 bars show on the phone. We replaced the Yagi but still no joy. The Carrier said there was no change in the tower (omnidirectional). I'm beginning to suspect the antenna jack on the phone because the phone still works fine elsewhere. We could try to find an older phone with an antenna jack or go to a new phone and one of your recommended booster systems. We only need voice, not data capability. It needn't work more than about 15 feet from the base station (if that) and could even sit in a cradle if there's some way of talking through the phone using copper. Years ago I remember considering a box of some sort at a point of better signal strength and hardwired to a regular dial phone. Is that another possibility? It wouldn't be possible to get power to such a box other than batteries. I've also mapped the coverage area from the tower (just basic ground level without signal strength) and the map corresponds to our experience of coverage and dead zones. Our facility is right on the edge of signal (though, again, using ground level as tower origin). Hi George. It's possible that the antenna jack is broken, but it's also possible that the cell tower was updated and the antennas were re-aimed in a different direction. If that's the case and there's truly no signal available in your area, then a cell phone signal booster won't be able to help unfortunately. If you can get a 1 bar signal in the relatively close area around the ski hut, then you probably do get enough signal for a booster to work. To get wireless coverage, something like a Wilson DB Pro Yagi kit is a great option. With a very weak existing outside signal, you should be able to get coverage within 10 to 15 ft from the inside antenna. Let us know if you think there is still some existing coverage nearby and we can talk about more options. Thanks George! I am from Canada and use Bell, I have a campsite where there is 1 bar of service (2bars on a very good day). I spend all day outdoors. What kind of system do you offer that will give me more signal strength without being directly connected to booster via cable? Does yagi work as a wireless repeater? I currently have a Wilson dual band signal booster in my truck, but I need to have phone on the cradle for it to work here. So basically I need everything(a booster, antenna, cables,ect.) to cover approx 90000sq feet (100 meters x 100 meters). Is there a kit available? Please help, as this is for my safety as I'm in grizzly bear country!! Unfortunately, it's nearly impossible to cover a large outdoor area using equipment that's available to consumers. Even with larger 80 dB amplifiers that are available in Canada, it would take multiple systems to cover anywhere near 90k sq ft which would cost many thousands of dollars and would require to you have a tall tower onsite to get adequate separation between the antennas. I'm sorry we don't have better news! I have Straight Talk using At&t towers. When I go to school and other rural areas, I no reception at all.. I do have reception at home which is about 20 miles from my school. What can I do to gain reception in rural areas? Will your product work? Hello Shanelle. If you get at least 1 bar of existing signal in those locations, then a signal booster will be able to help you. Signal boosters are not portable like a phone, so you would have to install on either in your vehicle or in a building/home/office/etc. So let me know a little more about what you're trying to accomplish and where you need the coverage and we can recommend a system for you. I live in a mountainous area. There is no signal outside the house but I can get 1 bar and make a call about 200 yards up the hill. Is there a set up where I can put the antenna up the hill and run the cable to the house? I don't mind plugging the phone in inside and using a Bluetooth headset. Unfortunately, 200 yards is too long of a cable run for an outside antenna. With a cable that long, you would loose any signal that the antenna is able to pick up. When you get to the spot where you can make calls, how high above your house are you? Would it be possible to add a pole to your house that would get the outside antenna to roughly the same height? Have you tried going up on your roof to see if you can get any existing signal up there? A friend of mine lives off the coast of Panama, on a small Island. It is possible to get a weak signal from Claro Panama and she would like to improve the signal by using a Yagi antenna. Claro is using GSM 1900 . Is the Yagi still a solution at that frequency ? A Yagi Antenna alone won't help unless your friend can directly connect the antenna to their phone. Most phones no longer have external antennal ports unfortunately. So instead, you'll likely want a full signal booster system with an amplifier to increase the power. Our systems do support 1900 MHz. Have your friend contact us and we can walk them through a few options. I work in the middle of a concrete building in downtown Saint Louis. 20~feet away from the building I get 4G, full bars. While inside I am able to get 1bar of 3G data. I have no issues with the phone service itself. Is a full signal booster system the way to go? While a full signal booster system will definitely help you bring that 4G signal inside, you will need to be able to mount an antenna outside and run a cable into the building in order for it to work properly. If not, you could use a cradle booster to boost the 3G signal you get inside, but probably won't be able to get 4G with it. Happy to discuss in more detail, just give us a call at 1.800.590.3564 or email us at support@ubersignal.com. Unfortunately, our signal boosters will not work in Kuwait because the frequencies used there are different from North America. Our signal boosters are designed to boost the North American frequencies while Kuwait uses the European/Asian frequencies. I do not know of any signal booster that will work in Kuwait. I'm sorry I can't be of any help. Hello I hace a farm situated a few km from the village, I do get signal just very very weak and other sporadic from 2 carriers is it possible to use a Yagi to get a stronger signal? Can I use the booster in the outside or only inside a building? Our signal boosters are only designed to be used inside. Let me know what country you plan to use this in and what carriers you need to boost and I'll let you know if we have anything that would work for you. Thanks for writing. Unfortunately, the equipment we sell will not work with the frequencies used by the carriers in Europe, so it won't work for you in Spain. Thanks for your question. If you have to go a full mile away before you get a usable cell signal, it's possible that there just isn't a strong enough signal at your house for a booster to work. How close are the neighbors that have the antennas you saw? Do you know that they're for a cell signal booster and do you have any idea how well they work? To boost the 2G and 3G signals from Telcel in Mexico, I recommend the FlexPro Yagi Kit. It comes with a directional outside antenna that isn't quite as powerful as the 14 dB 1900 MHz only antenna you mentioned, but it does work for both of the frequencies used by Telcel. If you also want to boost the 4G LTE network, then the SureCall TriFlex Yagi Kit is the best option. Choose the option for "TriFlex for T-Mobile, MetroPCS, Cricket, and Canadian Carriers (AWS)". This system supports all 3 frequencies that appear to be used in Mexico. Take a look at both options and let me know if you have any questions. I live in Montreal and there is a poor signal in my house (1 bar), outside in my front yard (2 bars) an no signal in my back yard. I called my carrier (Bell) to tell them about that problem. So in my house I have a lot a trouble to make phone call or receive them. I have to go on my balcony to make phone calls but usually I only get 2-3 bars. In some parts of my house even the text messages don't go through without trying 2 or 3 times. What do you suggested to improve the signal in my home? Thanks. Thanks for your question. 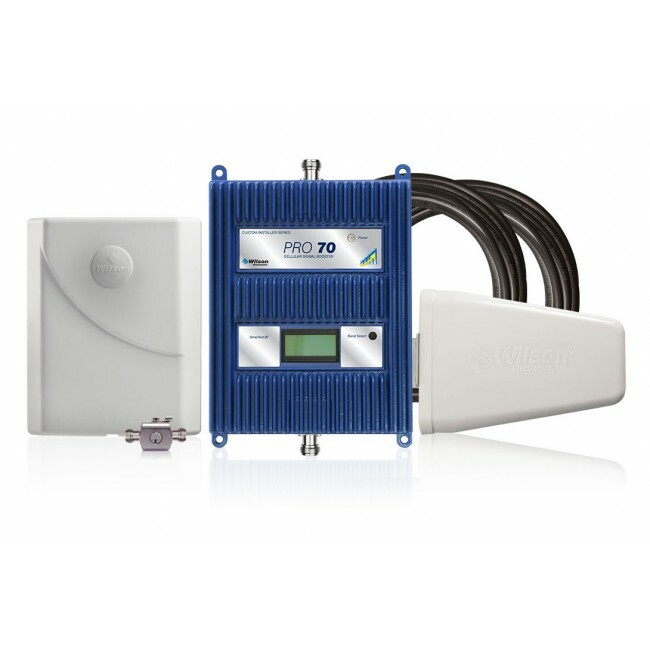 With a 2-3 bar signal outside of your house, a signal booster should work well for you. To recommend a system, we would need to know how large of an area inside you want to cover with a boosted signal. Also let me know if it's 1 story or multiple. Thanks Marie!